Spiderman, Batman, Iron Man, Superman, Thor and GI Joe assembled earlier this week at the Kingston General Hospital in Ontario for three hours of cheering window cleaning. The hospital’s photographer was on hand to capture the reaction on the wards and the pictures have been shared widely on social media. Luke Carter, aged seven, was in hospital serious injuries from a quad bike crash when the superheroes arrived. 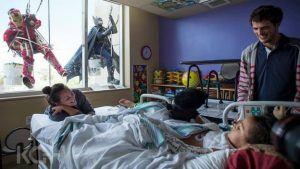 He was moved from critical care to the other side of the hospital so he could see them. Luke said the day had been “awesome”.